Chord Qutest review | What Hi-Fi? To Chord’s credit, a superlative was really the only way it could go when naming a successor to the excellent 2Qute. And with Chord claiming that its latest and most affordable powered DAC is the ‘world’s most advanced’, the Qutest carries such lofty expectations it would almost be embarrassing not to meet them. If a DAC could ever be excused such confident coolness, it is this one. After all, the Qutest is largely based on the Hugo 2 five-star recipient and a What Hi-Fi? Award-winner for 2018. It uses the same DAC architecture, software coding and frequency-shaping filters as the Hugo 2, but ditches the headphone amplifier and rechargeable Li-on batteries that make Hugo 2 portable. The Qutest’s sole purpose is to be the digital-to-analogue bridge between your digital source and amplifier – just like its predecessor the 2Qute, which the Qutest replaces in Chord’s five-strong DAC range. The lack of features reflects its lower price of £1195 (the Hugo 2 is £1800) - although the word ‘lack’ can only be used within the parameters of that specific comparison. The Qutest is no more lacking in either features or performance than a Swiss Army knife. It takes quite a few hours of operation for the Qutest to lose its out-of-the-box midrange hardness. Once that’s done, we swap out the Chord 2Qute sitting between our reference Naim NDS/555 PS streamer and Gamut D3i preamplifier, and put the Qutest in its place. We play Gregory Porter’s Holding On and immediately hear gains in clarity, precision and subtlety that have us gently pushing the predecessor to the back of our rack. The journey from the 2Qute to Qutest hasn’t altered the overall character. In 2015 we complimented the 2Qute for its “almost effortlessly cohesive and musical sound”, and thankfully those qualities haven’t been lost in transition. A soundstage full of crisp, clean, concise – not to mention explicitly detailed – instrumentation fills the space between our ATC SCM50 speakers, with the singer’s lush, down-tempo jazz arrangement having equal parts sinew and sparkle thanks to the Chord DAC’s familiarly neutral tonal balance. But the Qutest offers more resolution here. Greater texture and nuance cling to the wheeling cymbal, double bass plucks and Porter’s honey-thick vocals, all of which have plenty of room on the Qutest’s expansive canvas. Its presentation is slightly bigger and more spacious than that of the DAC it replaces, giving musical elements greater scope to evolve without bumping into each other. We play Peter Broderick’s Eyes Closed and Traveling, and there’s a new dynamic facility to our system. The piano piece is an exhibition of Broderick’s ability to shift from delicate to devastating within a few strikes of the keys, and the Qutest faithfully conveys the undulating dynamics, clocking the sudden surges as well as the subtler simmerings. Notes have crisper, more distinct leading edges, carry warmth and texture in abundance, and never decay prematurely – even when forthcoming notes tumble over the top. Timing is that bit tighter too, which helps the Qutest sniff out a rhythmic structure when one comes its way. With Biffy Clyro’s My Recovery Injection it not only captures the dissonance of that stinging lead guitar but also how it coalesces with the walking bassline and slicing cymbals. That rhythmic mastery is further revealed as we play Spoon’s Pink Up. The impressive drive, for which we’ve always rated the 2Qute, propels the disco-flavoured psychedelica on its unerring journey, and response to shifts in pace is slick and natural. From the soundstage-filling shakers to the xylophone melody and glitchy vocal, everything orbits the track’s solid metric beat. The Qutest is as happy rocking out to tumultuous tunes as it is rolling with classical compositions. The sonic upgrade served by the Qutest isn’t surprising when you consider it implements the bespoke FPGA (Field Programmable Gate Array) digital-to-analogue conversion technology found in every other Chord DAC. While most DACs use standard off-the-shelf chips, Chord designs its ones from the ground up. By creating a digital circuit that’s more customisable, Chord has greater control over everything from filtering to conversion. The software in the Qutest shares identical audio code with the Hugo 2, resulting in claims of ‘identical’ jitter performance and ‘no measurable' noise floor modulation (residual noise that occurs from changes in the music signal). The four filters are the same and, while they don’t make the world of difference, they’re worth experimenting with. ‘Incisive neutral’, ‘incisive neutral HF roll-off’, ‘warm’ and ‘warm HF roll-off’ are selectable via the Qutest’s filter roller button, which lights up in a different colour depending on the chosen filter. The only other button glows in various colours to signify the chosen input. There’s white for USB Type-B (capable of accepting 32bit/768kHz PCM/DSD512); yellow for the first BNC coaxial and red for the second (24bit/384kHz); green for the optical (24bit/192kHz/DSD64). But there’s no blue hue for Bluetooth. While wireless connectivity is a feature of the Hugo 2, which makes sense considering its portability, it’s left off here. It’s a shame perhaps, but far from a deal-breaker. The two coaxial inputs can also be used in dual-data mode, allowing the Qutest to handle (upsampled) 768kHz files from Chord’s Blu Mk2 CD transport. Whichever input path you choose, the output is through a pair of RCAs. Chord anticipates the Qutest being paired with a wide range of pre-amplification, so has made the output stage variable. Hold down both the input and filter buttons during the first 16 seconds after the Qutest has powered up - then you can select 1V (red), 2V (green) or 3V (blue). Through the small circular window is another multicolour display representing the sampling frequency of the file being played – red for 44.1kHz, green for 96kHz, dark blue for 192kHz, purple 384kHz, white for DSD. Those without a photographic memory may have trouble remembering the purpose of each colour, but the rainbow display certainly makes for a distinct design. So satisfied are we with the improvements accompanying the Qutest, we ask ourselves (as we did with the 2Qute): where next for Chord’s ‘budget’ powered DAC line? We don’t know the answer, or even what such a successor would be called. Qutester doesn’t work. But, from experience, we reckon Chord might (in a year or two) find another way to hoist the benchmark another notch. No pressure. 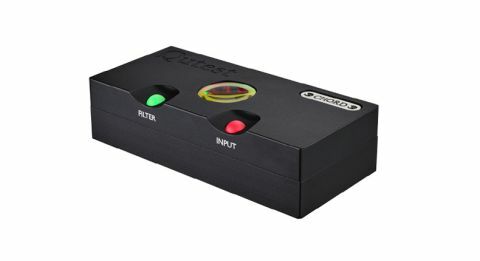 Until then, or until a superior DAC from another brand comes along, the Qutest occupies the gap in the pecking order between the Chord Mojo and Chord Hugo 2 as the DAC which lesser rivals look up to at this price mark.